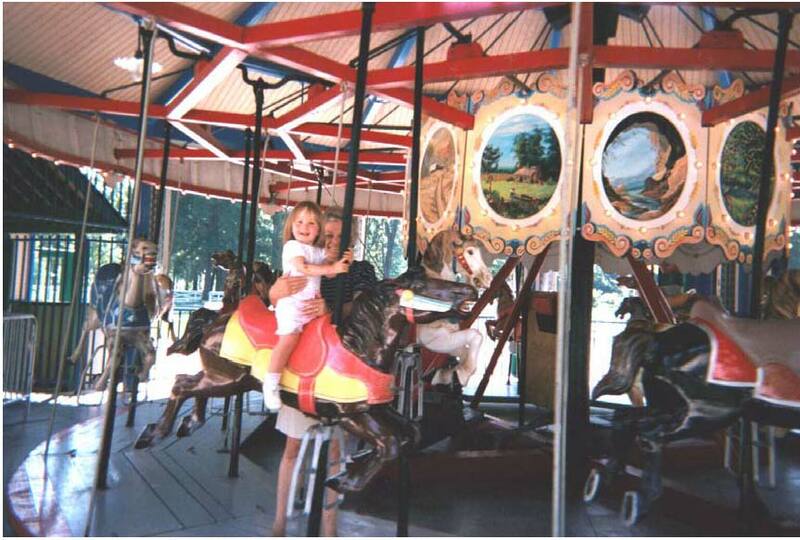 A little girl enjoys a ride on the 1920 Allen Herschell Company “Little Beauty” Carousel, located in Noblesville’s Forest Park. Noblesville (population 39,350), county seat of Hamilton County, was platted by William Conner and Josiah Polk in 1823. Conner, who was one of the area’s earliest white settlers, previously had established the first trading post in central Indiana. In 1851, the Indianapolis, Peru, and Chicago Railroad came through town. It and later railroads helped to encourage the community’s economic growth. Noblesville’s Indiana Transportation Museum celebrates this heritage with a museum, historic rolling stock, and excursions on the historic rail line. In the late 1880s, Noblesville incorporated as a city and found new prosperity after discovery of natural gas. The resulting economic boom led to the development of many of the notable historic buildings that today are part of Noblesville’s three historic districts listed on the National Register of Historic Places. In 2007, the city adopted a new Downtown Strategic Development Plan to help guide improvement of the historic commercial core. The plan proposes leveraging assets such as the White River (which runs through town), the historic buildings of Downtown, and the surrounding historic neighborhoods. Initial implementation of the plan has included a marketing campaign for the downtown and establishment of a façade improvement grant program. The Noblesville Preservation Alliance was founded in 1987 and sponsors an annual tour of historic homes, preservation awards, and other outreach efforts. Noblesville Main Street, Inc., created in 1994, works to promote the economic health of the historic downtown. Complementing the efforts of these non-profits is the work of the city’s Historic Preservation Commission.